SPOILER My brother found the Street Fighter reference Capsule by accident! You can do a Hadouken!!! How awesome is that? XD I LOVE Megaman X for the SNES! Not really a spoiler that anyone who has played MMX knows about the Hadouken. Lol Although it was nice to see how excited you are for finding it Retro it reminds me when I first found it lol. I believe it is Megaman X2 that has the dragon uppercut that Ken and Ryu do as an Easter egg. @Waveboy: I remember the California Raisins cartoon, I had the Raisins bedsheet set and went as one for Halloween one year lol. And yes Darkwing Duck did remind me of the Megaman games it was probably my third favorite after Ducktales and Chip N Dales. As for Talespin umm yeah it was horrible I still have that game too I think I maybe beat it once thats how bad it was. Lol, just thought I'd be safe, because I know I'd rather find a cool Easter egg like that then read about it n a forum. I'm sure anyone who had been following Capcom through the SNES days would have been excited by it. History repeats itself I guess. EDIT: Man the X series use to be so good, I haven't beaten the game yet and I'm already hunting down (and found!) good deals on x2! What happened to you Capcom! And I'm not sure i even feel like getting a Genesis....I had one as a kid, and while there were a few or so title I dug it just kind of leaves a bad taste in my mouth, especially in comparison to the brilliant stuff that hit the SNES during the time. But I'll always have a soft spot for Castle of Illusion, Splatterhouse 2, Rock Knight Adventure and a few others. King Of Demons was only available on the super famicom im lucky i found an english repro cuz i was about to pay almost 300$ for the Japanese version! if you break the tabs in yer snes you can play super famicom games as well, but i wont break my snes tabs...i use my retron3 instead. I believe you mean Rocket Knight Adventures. Well ya, that's what happens when you don't spell check. Time to unleash my latest and incredibly ultra awesome tweakin' geekin' Retro Purchases. I HAVE THE POWERRRRRRRRRRRRRRRRR! And The first Season of He-Man on DVD. Timeless stuff! The Cartoon Intro alone used to give me goosebumps as I child. And as much as I loved the Masters of the Universe 'live Action' He-man movie, I wish the entire thing would of taken place in Grayskull.....And instead not being zapped to our world just so the producers could save a quick buck.lol The Parts However where it did in fact that place in Grayskull were totaly brilliant! Evil Lynn was hands down the most and menacing female villian in any movie I've seen. Those demonic cat-like eyes, that sadistic voice, aghhh. But whatever, this has nothing do with the beloved and magical cartoon series hehe. Anyways, can't to wait to get my He-man action on when this baby blasts out of the mail box. 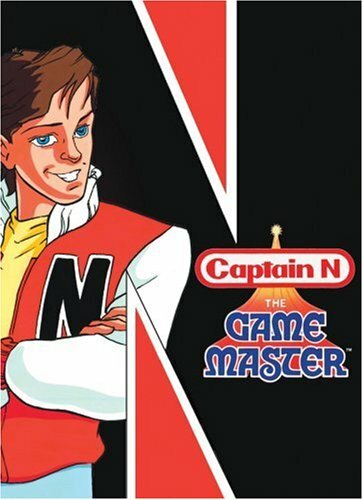 Captain N: The Game Master - The Complete Series! Man oh man, this one of my favorite cartoons growin up...Say what you want about the gremlin trollish sounding midget-fied Mega Man, or Pit who would constantly say Icus whenever he'd bust out a line, or Simon Belmont who was hands down the biggest WTF out of the bunch.lol The evil King Hippo & Egg Plant Wizard duo on the other hand was pure genious.. Finally, finally got a copy of DuckTales, another Nes Classic i have some pretty sweet memories of...Aside from putting the controller down during that Translevania stage and having to get stitches on my foot from a whacky bad Summer Gator slip n' slide incident where i slid over broken glass. Ya, I'm lucky it was only my foot. eek! Back in 89' when I was 5, I got this as a Vacation Gift from my mom who just got back from Hawaii and boy was I happy. The next day i was playing it all night, meanwhile my Baby sitter and her boyfriend were making out behind me under the covers on the couch god knowing what else they were doing. All I heard were smoochies and yadah yadah, but i didn't care I was just too into Contra. Ahhh, Ninja Gaiden, Ninja Gaiden. This was flipping brilliant back in the day....Way back, one of my friends introduced me to this amazing gem at his house on a hot sunny aftertoon. I remember him and I sitting on the floor close to the TV in his living room and playing the first stage, while having turns each time we died. But you see, this friend of mine had an insane temper problem....it was crazy bad. But with zero weapons! I got a great deal, besides it would of cost me $20 more alone just get CJ's Golf Clubs and nap sack. lol Honestly though I can do without Tragg and Genghis Frog's accessories anyways. And ahhh, I just loved these figures growing up, they're so classic, striking and colorful. Nostalgia was in full force, and I couldn't say no to these finger biting ghoulies. lol I used to have these as a kid, their mouthes basically extend all the way back, and when you press on their tounge they lash down crushing your finger into 5 year old ghost dust.lol They may look innocent, but don't be fooled! I remember having these, along with my Stay Puff Marshmellow man, Slimer, Ray and Egon figurines, and a big box of chocolate twinkies the first time i ever watched Ghostbusters on VHS. I'm definitly going to be wearing these for my 80's costume this Halloween. An Autographed(Or it will be) A Nightmare on Elm Street 3: Dream Warriors 'Official Photo' of Nancy & Freddy signed by Heather Langenkamp aka > Nancy. What can I say, I go ga ga for anything ANOES related hehe. where did you find those most righteous shades? Just last week, I picked up the complete series of Sonic SatAM. Pretty good show so far. Oh man, those ninja turtles action figures totally brought back memories, I would spend hours playing with those things while watching the cartoon or movies. Good choice in NES games too, if you like Duck Tales you should give Chip n' Dale a shot, it's another great Capcom-Disney game. Ya, i think we all did during the turtlemaina back in those days.lol Good times! But ya, Ducktales, Ninja Gaiden and Contra are such boring, ordinary and safe choices. But those 3 are in my top 10 favorite Nes games, so i just had to get them to finish that up. I've got around 20 Nes titles on my 'to get list' and a few or so of them are more obscure and interesting, like Kickle Cubicle, Kid Niki: Radical Ninja, or maybe even Yo' Noid.....Then again! And Chip n' Dale is definitly another good one, maybe a little too easy but i found it just about as good as DuckTales. Either way you can't do wrong with either! Tail Spin is another story. @WaveBoy Do you remember that old California Raisins Christmas special, that used to appear on local T.V. That really brings back memories. The first season of Heman is available for streaming on Netflix, for anyone who has Netflix and is interested. I never really cared for the Masters of the Universe live action movie, even though I bothered my mother to see it forever. @WaveBoy You said you like classic horror movies from the 80's. Well I'm trying to remember the title of one, maybe you can help me. It's a film about a huge church or university and a group of people that are trapped inside and terrorized by all types of evil aberrations. At one point I remember there was a floating nun. It wasn't "Prince of Darkness" because I thought it was until I recently watched it. or maybe even Yo' Noid.....Then again! That game's actually not too bad. Though it definitely will become a pattern-memorization game. I haven't actually finished the game yet, but I've played about half of it. Perhaps the game is decent because it's pretty much just a graphics hack of an unrelated Japanese game. I'd say it was worth the $2 and shipping I paid for it on ebay. EDIT: The pics were pretty large, so I'll just post the links to the blog posts where i put the pics up instead! Haven't bought it yet, but I am trying to get an NES! I've found multiple auctions on seller refurbished NES's. The one I'm keeping a close eye on comes with the NES, all hook-ups, my choice of 2 classic controllers or 1 classic and 1 NES Max controller, (If you have any suggestions on which pair to go with that'd be nice. I'm just going with 2 classic controllers right now) 1 Zapper, and my choice of 5 games. I'm going to choose Super Mario bros/duck hunt, 2, and 3, Metroid, and Ducktales. Hoping I can win the auction. If I get it I'll probably hunt down a copy of Megaman 2 also. Dude, did you just say the California Raisens? As in the talking Jazzified claymated California Raisens with the funky musical instruments?lol Aside from the food, I actually had a few California raisen toys back in the day, They didn't do much but i just loved them for some reason. And awesome commercial by the way! Which remindes me, I definitly need to the get the complete Ghostbusters Cartoon series on DVD soon! Do you remmeber the first Boogey man episode? That gave most of the us kids nightmares back in the day. @WaveBoy I loved the California Raisins. I had this hat, it was like painter hat style with the flat top and had California Raisins all dancing all the way around it. It was so awesome! I also had the figure of the guy with the 80's shades and my sister had another. They were boring toys but for some reason I thought they were cool. Claymation is another I miss from taht time period, loved that commerical. They sure dont make things like that anymore now do they!